Ortega won re-election in late 2016 with 72 per cent of the vote, but a poll in May by CID Gallup showed his approval ratings had fallen to 29 per cent. Managua: Nicaraguan President Daniel Ortega urged protesters on Thursday to end what he described as their attempt to destabilize the country after police and heavily armed supporters suppressed weeks of protests in clashes that killed almost 300 people. Speaking on the 39th anniversary of the Sandinista revolution in which Ortega overthrew a dictatorship, the ex-guerilla called on tens of thousands of cheering supporters to defend their country and for protesters to “rectify” their behaviour. “You all are the defenders of peace … We have to re-establish order in our country,” said Ortega, wearing Nicaragua’s flag colours with a white shirt and blue baseball cap. International condemnation of Ortega has grown sharply in the past week over his deployment of police and allied paramilitary forces to quash the unrest, during which almost 300 people have been killed and many more injured since the protests began three months ago. The violence marks the most severe crisis to face the 72-year-old socialist since the civil war of the 1980s when he battled U.S.-backed “Contra” rebels. Currently serving his third term after winning electoral office in 2006, Ortega is resisting demands for his resignation and early elections. Ortega supporters flocked from around the country to the event near Xolotlan Lake north of the capital adjacent to a towering black silhouette of Nicaraguan revolutionary Augusto Sandino, whose resistance to the 1927-33 U.S. occupation of the Central American country inspired the movement named after him. “As Nicaraguans, we can’t keep living in war,” said Ortega supporter Norman Ortiz, referring to the nation’s history of bloody conflicts. Cuba and Venezuela’s foreign ministers, who reject external interference in the country, supported Ortega at the event, describing the protests as attempts at a coup. 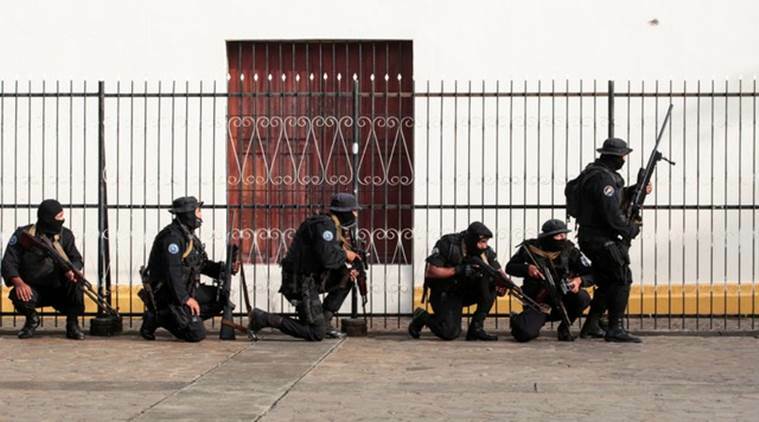 Since last weekend, forces loyal to Ortega beat back protesters in Managua and the nearby city of Masaya, a legendary revolutionary bastion from which Sandinista rebels launched their final attack against right-wing dictator Anastasio Somoza. The unrest began in April, when Ortega proposed reducing pension benefits to cover a budget shortfall, and quickly spiralled to encompass a range of concerns. Protesters condemn what they describe as the government’s control of the media, electoral fraud, manipulation of the justice system and corruption, as well as Ortega’s “family dictatorship” running the country with his wife, Vice President Rosario Murillo. “The people are no longer with Ortega,” said Arlene Correa, speaking earlier on Thursday near the capital’s notorious El Chipote jail, one of the main sites Somoza’s government used to torture dissidents. “He seems more and more like Somoza with the violations of human rights and killings,” said Correa, whose father has been accused of supporting the protests and was detained earlier this week in Chipote. Ortega won re-election in late 2016 with 72 per cent of the vote, but a poll in May by CID Gallup showed his approval ratings had fallen to 29 per cent. The country appeared mostly calm on Thursday, despite violent confrontations in recent days and pledges by protesters to plan new demonstrations.